"We lack enough space in our stockpiles to house our missiles," said General Hossein Salami, the Guards' deputy, as a row with the US over Iran's ballistic missile programme deepened. "Hundreds of long tunnels are full of missiles ready to fly to protect your integrity, independence and freedom," he told worshippers in Tehran, promising to never "stop developing our defence deterrent". 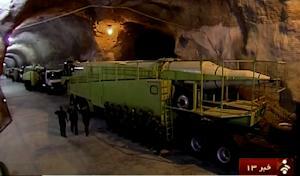 Iranian state television aired in October unprecedented footage of such an underground missile base. The general's comments came after reports that the US had planned -- but later shelved -- to unveil a fresh round of sanctions following two recent missile tests by the Islamic republic. The mooted financial penalties on companies and individuals in Iran, Hong Kong and the United Arab Emirates, for apparent links to Tehran's missile programme, highlighted worsening US-Iran relations. They also put in jeopardy a landmark deal struck in July between Iran and six world powers including the US, which is due to be formally implemented within weeks. Iran's President Hassan Rouhani denounced the US moves Thursday as "hostile and illegal interventions" that must be met with a response. He ordered the military to intensify its missile development and take whatever steps necessary to start new programmes if they would better serve Iran's defence. This is more evidence of the bad judgment exhibited by Obama and other leaders in cutting a deal with Iran that will provide the funds for more weapons development as well as fund their terror operations. Why do Trump voters trust him? New York values that are being rejected in Iowa? Breakthrough in attack on Russian jet? It would only matter if she were a Republican? Hillary guarded by terrorist on Libya trip? Trump a thin skinned tyrant? Will Trump eat his words in Iowa?